If you want to learn about Network Analysis, take DataCamp's Network Analysis in Python (Part 1) course. Networks are everywhere, networks of roads, a network of friends and followers on social media, and a network of office colleagues. They are playing a significant role in our day to day lives from spreading useful information to influencing national elections. The ability to analyze these networks and make informed decisions based on them is a skill that is important for any data analyst. 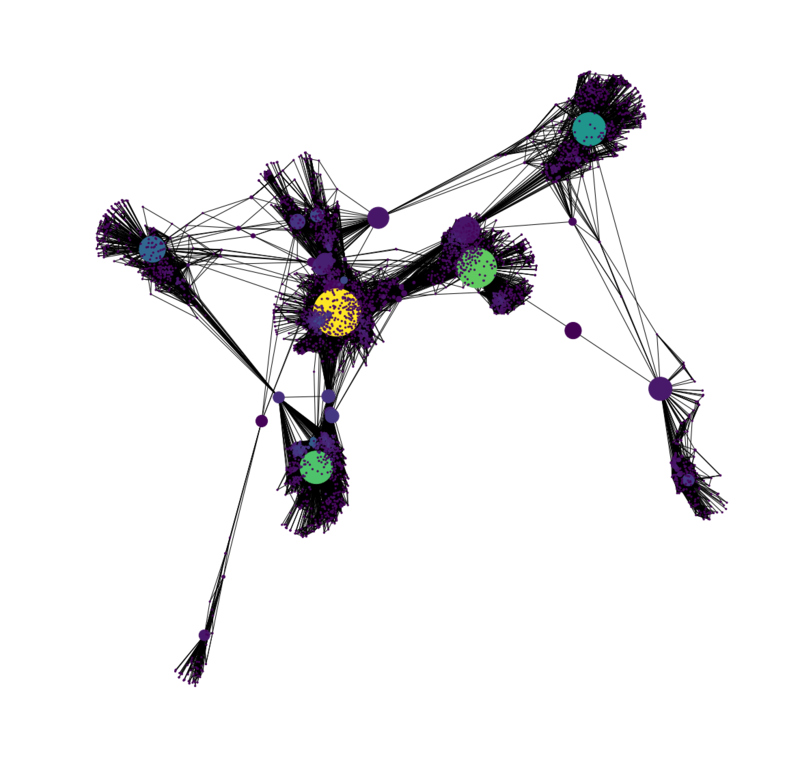 The focus of this tutorial is to teach social network analysis (SNA) using Python and NetworkX, a Python library for the study of the structure, dynamics, and functions of complex networks. This tutorial assumes that the reader is familiar with the basic syntax of Python, no previous knowledge of SNA is expected. Let us first start with what do we mean by Social Networks. Below you see a network of Bollywood actors as nodes. They are connected with solid lines if they have worked together in at least one movie. 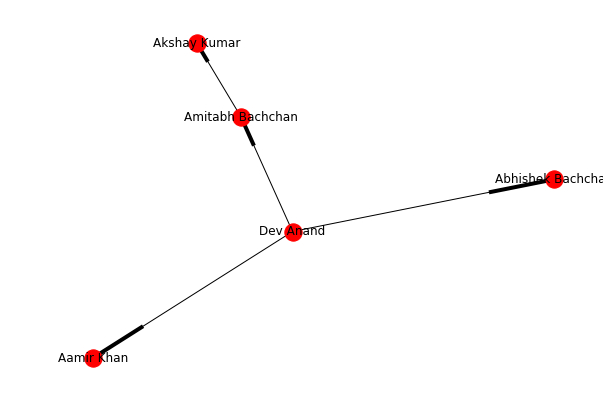 So, we can see that both Amitabh Bachchan and Abhishek Bachchan have acted with all the actors in the network, while Akshay Kumar has worked with only two Bachchans. Interesting right! This too is a social network. Any network with connections between individuals, where the connections capture the relationship between them is a social network. 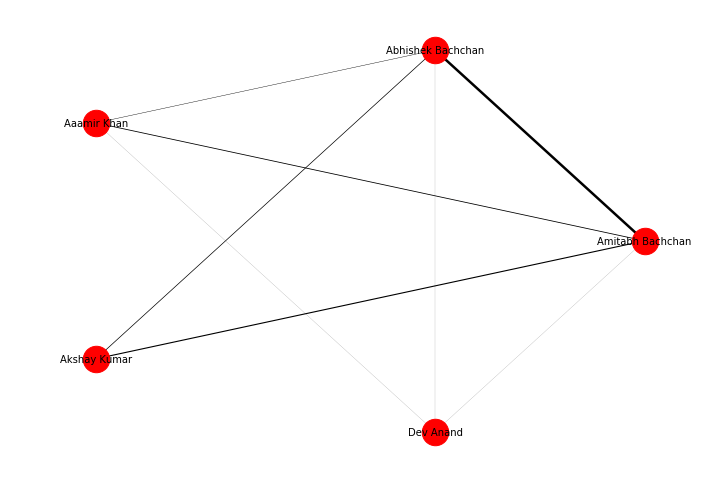 Analyzing these networks can give us great insight about the people in the network like who are real influencers, who are most connected, etc. Nodes: The individuals whose network we are building. Actors in the above example. Edges: The connection between the nodes. It represents a relationship between the nodes of the network. In our example, the relationship was that the actors have worked together. This will install the latest version of networkx. The codes in this tutorial are done on Python=3.5, NetworkX = 2.0 version. The first network of actors that we created above is a symmetric network because the relationship "working together in a movie" is a symmetric relationship. If A is related to B, B is also related to A. Let us create the network we saw above in NetworkX. We will be using the Graph() method to create a new network and add_edge() to add an edge between two nodes. Let us now visualize the network we have just constructed using nx.draw_networkx(G_symmetric). What if the relationship between nodes is 'child of', then the relationship is no longer symmetric. If A is the child of B, then B is not a child of A. Such a network where the relationship is asymmetric (A is related to B, does not necessarily means that B is associated with A) is called an Asymmetric network. We can build the asymmetric network in NetworkX using DiGraph method, which is short of Directional Graph. Let us make an asymmetric graph. Now we visualize it. We can use the draw_networkx() function as before. However, it is possible that nodes do not separate out and are distinctly visible in the network drawn. To take care of this, we can use the function to force a layout, which positions the nodes in a manner that we can distinctly see them. We can accomplish this using spring_layout() function, followed by the draw_networkx() function. Below you can see the network with and without using the layout command. The one made using the layout command has more clarity. Till now we had networks without weights, but it is possible that networks are made with weights, for example, if in our initial network we consider the number of movies done together as a weight, we will get a Weighted Network. Let us make one again of the actors, but this time we add weight to the network, each edge has a weight signifying the number of movies they have done together. The figure above shows the weighted network of actors in a circular layout. The edge width specifies the weight between two nodes. We can give different attributes to the edges. For example, we can define a relation of neighbor between two nodes 'A' and 'B' using relation attribute. If within a network two nodes are connected with two different edges (relations) we have a multigraph. We can make a multigraph utilizing the MultiGraph class. Now the network is made, can we know more about a particular node in the network? Well yes, let us explore some of them. Degree of a node defines the number of connections a node has. NetworkX has the function degree which we can use to determine the degree of a node in the network. This will return a value of 3, as Dev Anand has worked with only three actors in the network. It is observed that people who share connections in a social network tend to form associations. In other words, there is a tendency in a social network to form clusters. We can determine the clusters of a node, Local Clustering Coefficient, which is the fraction of pairs of the node's friends (that is connections) that are connected with each other. To determine the local clustering coefficient, we make use of nx.clustering(Graph, Node) function. 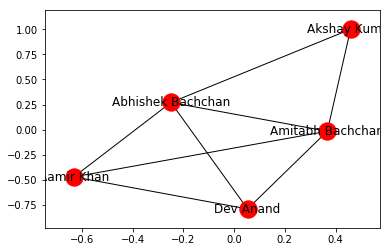 In the symmetric Actor-network, you will find that Dev Anand has a local clustering coefficient of 1 and Abhishek Bachchan has a local clustering coefficient of 0.67. We can also determine the shortest path between two nodes and its length in NetworkX using nx.shortest_path(Graph, Node1, Node2) and nx.shortest_path_length(Graph, Node1, Node2) functions respectively. Eccentricity of a node A is defined as the largest distance between A and all other nodes. It can be found using nx.eccentricity() function. 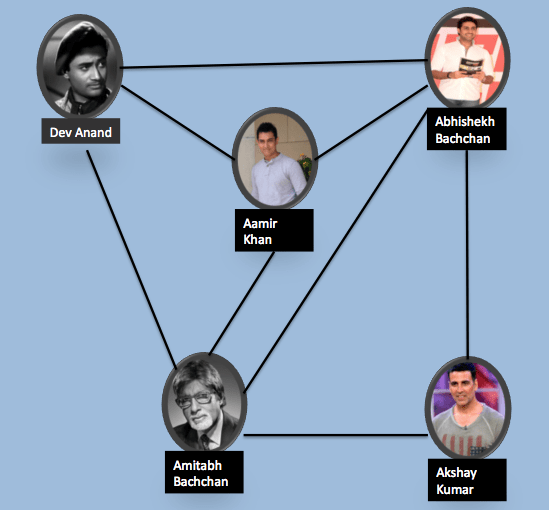 In the symmetric Actor-network, Dev Anand has an eccentricity of 2, and Abhishek Bachchan has an eccentricity of 1 (It is connected to all). Above we learned some of the network distance measures, they are useful in knowing how the information will spread through the network. In this section, we will learn how to find the most important nodes (individuals) in the network. These parameters are called as centrality measures. Remember that popular girl from your high school or the schools top baseball player. These were the people who had the power to make your high school experience hell or heaven. What gave them this power? Centrality Measures can help us in identifying popularity, most liked, and biggest influencers within the network. The people most popular or more liked usually are the ones who have more friends. Degree centrality is a measure of the number of connections a particular node has in the network. It is based on the fact that important nodes have many connections. NetworkX has the function degree_centrality() to calculate the degree centrality of all the nodes of a network. It is not just how many individuals one is connected too, but the type of people one is connected with that can decide the importance of a node. In Delhi Roads whenever the traffic police capture a person for breaking the traffic rule, the first sentence that traffic police hears is "Do you know whom I am related to?". Eigenvector centrality is a measure of exactly this. It decides that a node is important if it is connected to other important nodes. We can use the eigenvector_centrality() function of NetworkX to calculate eigenvector centrality of all the nodes in a network. The Google's Pagerank algorithm is a variant of Eigenvector centrality algorithm. The Betweenness Centrality is the centrality of control. It represents the frequency at which a point occurs on the geodesic (shortest paths) that connected pair of points. 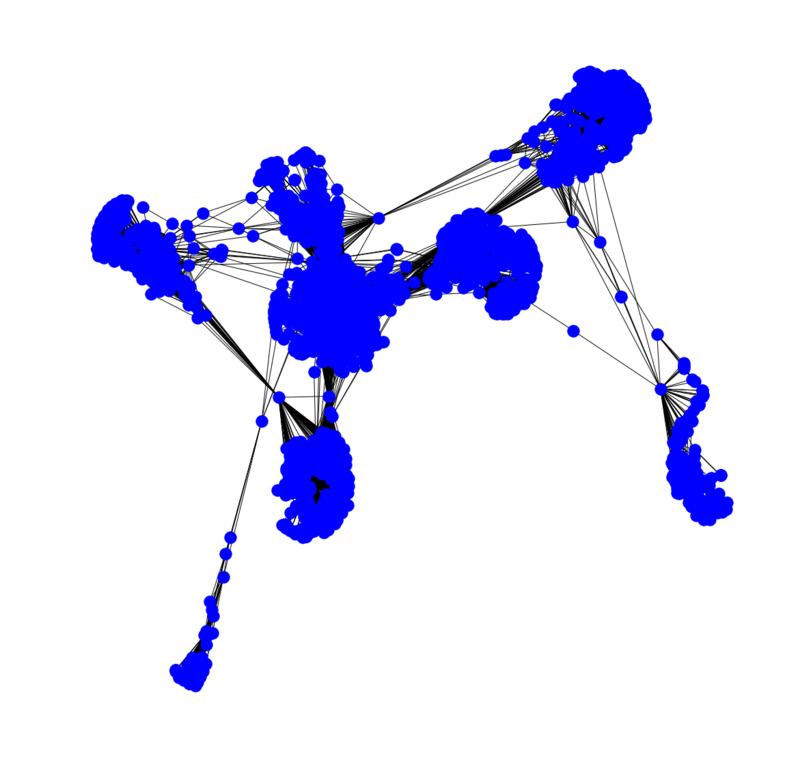 It quantifies how many times a particular node comes in the shortest chosen path between two other nodes. The nodes with high betweenness centrality play a significant role in the communication/information flow within the network. The nodes with high betweenness centrality can have a strategic control and influence on others. An individual at such a strategic position can influence the whole group, by either withholding or coloring the information in transmission. Networkx has the function betweenness_centrality() to measure it for the network. It has options to select if we want betweenness values to be normalized or not, weights to be included in centrality calculation or not, and to include the endpoints in the shortest path counts or not. Let us start with the Facebook data, for our analysis here we will use Facebook combined ego networks dataset, it contains the aggregated network of ten individuals’ Facebook friends list. You can download the required facebook_combined.txt file from the Stanford University site. You can get your own Facebook/Twitter data using the Facebook/Twitter APIs. Look forward to the next forthcoming tutorial where we will learn how to use Facebook and Twitter APIs to get data and use the information acquired here to analyze it. The network consists of 4,039 nodes, connected via 88,234 edges! Yep, it is a big network. You get the information using the info() function. The table below lists the five node labels with the highest centrality measures. We can see that some nodes are common between Degree Centrality, which is a measure of degree, and Betweenness Centrality which controls the information flow. It is natural that nodes that are more connected also lie on shortest paths between other nodes. The node 1912 is an important node as it is crucial according to all three centrality measures that we had considered. If you want to learn more about Social Network Analysis in Python, take DataCamp's Analyzing Social Media Data in Python course.